Filter your Excel data if you only want to display records that meet certain criteria. 1. Click any single cell inside a data set. Arrows in the column headers appear. 3. Click the arrow next to Country. 4. Click on Select All to clear all the check boxes, and click the check box next to USA. Result. 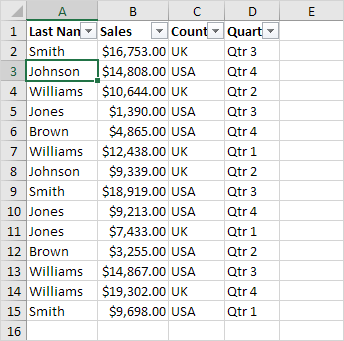 Excel only displays the sales in the USA. 6. Click the arrow next to Quarter. 7. 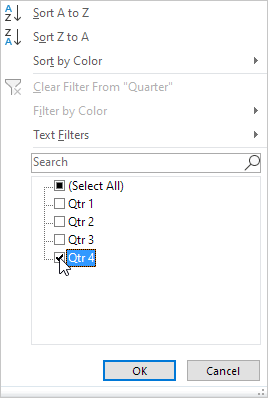 Click on Select All to clear all the check boxes, and click the check box next to Qtr 4. Result. 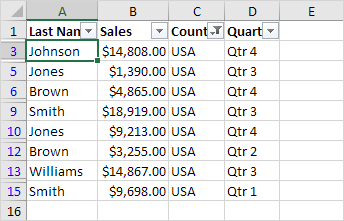 Excel only displays the sales in the USA in Qtr 4. 9. 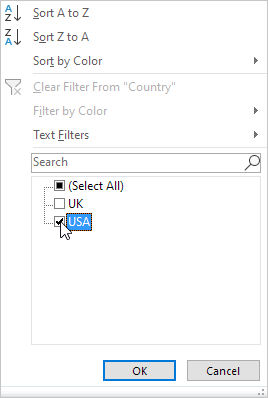 To remove the filter, on the Data tab, in the Sort & Filter group, click Clear. To remove the filter and the arrows, click Filter.